If you have never been on a cruise, now is the time to come on board. 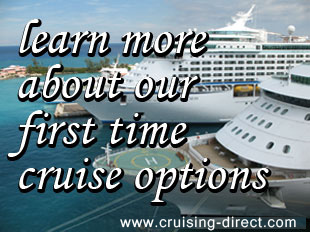 But with so many choices out there, how is the first time cruiser supposed to choose? People go on cruises for a variety of different reasons and selecting a destination depends on several factors. Firstly, like any holiday you plan, the first thing you must ask yourself is “What is the purpose of the cruise? What experience do I want to get out of it?” Are you looking for romance or adventure? Do you crave relaxation or exploration? Rain forests or snow capped mountains? Do you want to spend time with animals or with people? Obviously, if you are looking for warm weather, a cruise to Alaska or Antarctica would not be on your list. There are no free roaming tigers and elephants in Europe so choose Africa or South America for wildlife and safaris. And if you want to relax on a beach, you should choose a cruise with ports of call requiring a minimum of walking and sightseeing. If you are looking for a little of everything, and most first time cruiser usually do, choose one of several cruise destinations that offer something for every taste. For example, the Caribbean offers well known tourist attractions, as well as serene sandy beaches, . Cruises to Europe offer varied destinations and can include a wide range of architectures, interesting histories and a choice of many different cuisines. Other destinations offer adventure and a variety of activities. A cruise to the Galapagos Islands, for example, is an incredible cruise adventure. There you will find wildlife that is native only to the Island. Galapagos is a wildlife sanctuary so forget the jeep ride, the stroll around shops or dinner at a variety of restaurants. Instead, you will be exploring the natural habitats of a variety of plants and animals, enjoying some breathtaking scenery and snapping away with your camera at every opportunity. No nightclubs and entertainment, just a unique lifetime experience. If you have the time and the money to take a few months off to travel, a world cruise is the ultimate cruise event. Once you have decided that spending 3-4 months on a moving vehicle is what you wish, you must then decide on your itinerary. When choosing a cruise line, check out how much time your ship spends in port. Though you will relish a few days on shore after months in the water, it is still advisable to know the breakdown of the trip. A world cruise should be relaxing and adventure filled. Once you have unpacked and settled into your cabin, you will be moving together with your floating hotel for the length of your stay. So choose wisely and bon voyage.